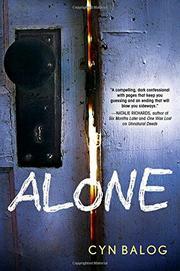 A thriller in a decrepit, isolated mansion—and in the double-occupancy mind of a teen girl. When Seda’s professor mother, a horror-film scholar, inherits the crumbling remains of what was once a rural hotel used to host murder-mystery events, the family’s supposed to have a quick summer to tidy it up for sale. But her mom stalls and vetoes any prospective buyer who doesn’t want to run it as-is, leaving her and her children (Seda and two sets of younger twins, each a boy-girl pair, ages 6 and 4) stuck on the mountain come fall. Seda wishes she could be more alone in her own head, though—she’s plagued by her lifelong imaginary friend, Sawyer, who tells her to hurt herself and others. Seda suspects he was her own twin, absorbed in the womb. Sawyer knows it’s a bad idea to let the teens stranded by a snowstorm into the house, but Heath, their spokesman, is cute, and Seda’s mom insists, roping everyone into a murder-mystery game she’s written for Seda’s birthday celebration. Just when readers are lulled into a false sense of security—and even Seda notes Sawyer’s silence—the elaborate game heats up. Each new bit of information builds, and in a house full of potential victims, readers will be compelled to rush and unravel the twisted mystery. Aside from one Chinese character, the cast is white; at one point Heath playacts Robert E. Lee.